Part of the proceeds from sale of artwork go to Telethon Speech & Hearing. 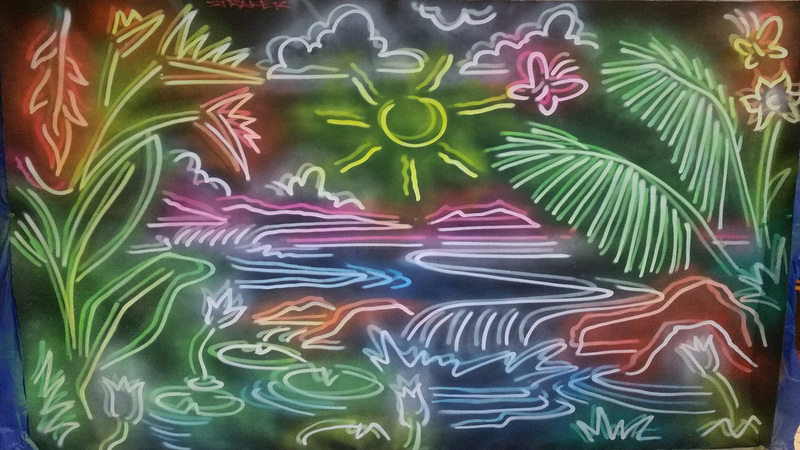 Tropical Island was painted by Drew Straker ‘The Muralist’ on the night of Artitude Amplified 2018. “Graffiti art creates a window of opportunity to youth that would not otherwise have a connection with paintings, let alone the world around them. Graffiti provided me with the fundamentals of mural painting and incidentally forced me and my friends to become avid photographers, there were times when our pieces could be gone come 7am so we we’re like our own paparazzi! Materials: Oils on Canvas with Pearl Nacre Powder & Crushed South Sea Pinctada Maxima Oyster Shell.